This book i read umm well long back but it's as refreshing as new in my memory .This one was special ,thanks to beautiful Tina mam who lend me the book :) . The book is amazing .The chacters Professor Langdon and Sophie takes you through a journey myths, history, symbolism,religion,secret societies,sciences..This book here gives new reading environment that's very intriguing.The writing style of the writer is awesome,he knows how to keep the reader hooked. The religion ,secret practices by secret societies by some very powerful men,the secret of Holy Grail. 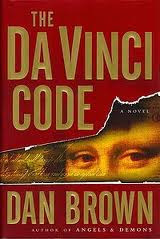 The symbolism involved,God's ratio,secret of Monalisa painting,the last supper.The Secret Archives Of Vatican. There are so many intriguing things involved here that once you start you want to go on till you finish it. Let me give you something intriguing.. Did you know..that if we measure the distance from your shoulder to your fingertips, and then divide it by the distance from your elbow to your fingertips.You will get PHI ratio i.e "1.618". Try another one from hip to floor divided by knee to floor.Want more try you finger joints .This is Divine Proportion. There many fun facts like this here about paintings ,secret societies,symbolism..just wow.